Dal curry awakens fond memories from my early days of marriage. Yes, I know that I have talked about this on our site before. When I write about dal curry, it’s difficult not to mention my Telugu friend and colleague from Hyderabad who made a mean dal curry - so to speak. Though a little too spicy, it was delicious!. Being unable to eat as much as I would like with the heat, I asked her once how many chilies she put in the curry and she said “a handful.” Wow! No wonder, I would exclaim. It was a joke between us how much I would still eat in spite of the heat in the curry. I have learned a lot from her, and when I started cooking this curry myself she would caution me - you better go easy on the chilies having a kid at home! Dal, in most Indian cuisines, is a side dish that goes both with rice and roti. As most dishes, it is cooked differently from state to state. However, it is a must have in a ‘Thali.’ My mouth waters whenever I think of a good lunch thali from my favorite vegetarian restaurant. I have tried to recreate some of that magic with this dish myself and hope you will enjoy it too. 1. Pressure-cook all the ingredients listed, except for tempering and set aside. 2. Heat oil in a pan, add the mustard seeds and let it splutter. 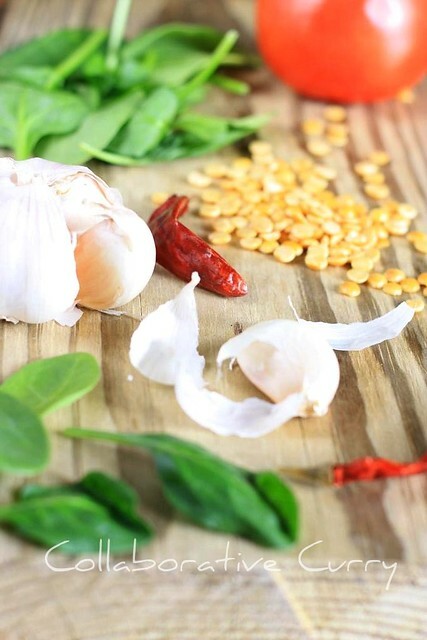 Follow it with chana dal and when it changes color to a light brown, add the grated garlic and red chilies. Saute` until the raw smell leaves. 3. Switch off the heat and add chili powder. Keep stirring until the chili powder is heated through. Be careful not to burn the chili powder. Pour the tempering over the cooked dal and mix. 1. You can add green chilies when you cook the dal, and skip adding the red chili powder in the tempering. 2. For the amount of dal given in this recipe, 3-4 green chilies would make the dish medium hot (spicy). 3. Sometimes, I cook the dal with salt and turmeric and add the remaining ingredients along with the tempering - sautéing after each addition until they are all cooked and mix into the dal. 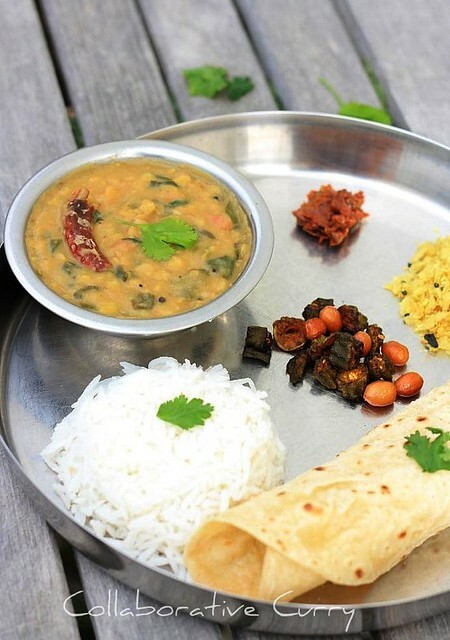 Wonderful spread, thick spinach dal looks simply delicious and fabulous.. Anything with spinach..count in me :)yummy with rice..2nd pic valarea ishttapettutto..
Dal palak is one of my favorite with rice, yours looks tempting and delicious! Yummy thali. dal looks absolutely delicious. yummm...comfort food for me! !..looks just like it make it! 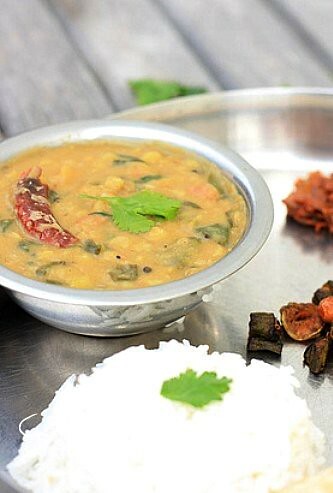 I like it spicy too..
looks simply delicious and fabulous..
Wow healty Plater,delicious dal...awesome clicks. wonderful dal...perfect with hot rice and ghee. Spinach dal is ultimate comfort food. I have an award waiting for you in my blog...plz accept it ! I love using these lentils too! I love spinach dal, esp the pappu made in Andhra. Urs looks awesome. Love the pics too. Look totally delicious and comforting! Love this plate of comfort food and very beautiful photographs too. Comforting and yummy spinach dal. Awesome Platter..looks so divine, comforting and absolutely delicious. By the way the pictures are gorgeous. We love dal curry. Never thought of including spinach in it. Sounds wonderful! The whole spread looks so comforting, dal curry looks very yummy..Love the clicks very much! Delicious..one tempting platter you have there..nothing beat a nice homey meal like this one! Love the healthy platter there, Namitha! Lovely clicks and a very comforting dal.